There’s nothing that quite unites the nation like gifs of Boris Johnson dancing, a sincere dislike of queue jumpers, and football. As you may have noticed, the Euros have started and I’m reliably informed that it’s a big deal. Today, as England and Wales face off for the first time in forever, we’re celebrating in true UKFast style – here’s why it’s good for team spirit! Today is the big day – the football furore has reached a peak for Brits as England and Wales step on to the pitch. And, with our CEO Lawrence being a proud Welshman himself, it’s all kicking off here at UKFast too. Kickoff is at 2pm and – always one to embrace competition and turn it into something fun – we’re having a Euro 2016 party here to celebrate. 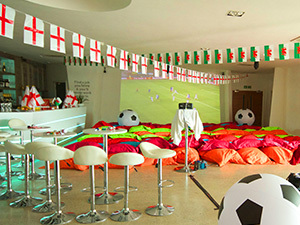 From two there will be BBQ, beers, bunting and beanbags, and the game displayed on a big screen. Of course, our top priority is still to keep our phones manned and the engine running, so those that are less interested have volunteered to keep things covered while the fans enjoy the match (we’ll be the ones laughing when National Chocolate Day comes around amirite?). The bottom line though, is that it doesn’t really matter which team you’re supporting, as long as you’re supporting one. Even if you’d usually rather put your head in the oven than watch men kicking a ball around a patch of grass, it’s a good opportunity to get involved in the excitement; and if you’re still really struggling, there’s a small community of people who were always picked last for sporting events boycotting that you can bond with instead (I’m already looking for recruits if anyone’s interested). This idea of team spirit is also something that runs through the veins of UKFast – we’re a unit, Lawrence is our captain (that’s about the extent of my football knowledge sorry, I won’t try and segue in an awkward analogy about the offside rule), and we all rally behind each other. Lawrence has also always been a big believer in happy team, happy life; and happy customers in turn. While some might not see the value of doing things like this for employees, as someone who benefits from them I can tell you first-hand that it makes you feel valued and motivated; even though I’m not a football fan myself the atmosphere here today is buzzing, and I’ll be enjoying a burger out on our beach at lunchtime! If we sound like a team that you could get behind, take a look at our careers page and see if you could be our next goalie, midfielder, forward starter, left hook (ok I’ll stop) – see if there are any positions here for you!